This year will start with the full power of Mars which will influence the signs with better luck in 2019 with some common characteristics, such as courage and determination, keys for achieving success in everything you set forth in. This year, Mars will provide extra energy to the followers of certain signs which they will be able to take advantage of in order to achieve the objectives that propose for the year. The 3 signs with the best luck in 2019 are Taurus, Leo and Aquarius. They will have good luck for most of the year, taking advantage of the strength and courage of the red star to face adversity, overcome conflicts and problems. The year will begin well for Taurus in every area. They will become more responsible and aware of their role in the family, at work, with respect to their own well-being and that of those around them. The influence of Jupiter and the dwarf planet Ceres at the beginning of the year will make the followers of the sign wiser and more determined. In 2019, Taurus will be very responsible for achieving the highest level of economic well-being and comfort for themselves and their families. Thanks to astral influences they will find allies in financial matters that will bring them onto another level, leaving behind some of their more worldly concerns. They will recognize their physical and spiritual needs and have the clarity and energy necessary to make changes to their habits, achieving a better quality of life and physical and emotional well-being. Halfway through the year, their emotional state will be one of the year’s best, and they will enjoy romantic relationships, on both an intimate level, and with everything that concerns emotions. They will enhance their natural talents and use them to develop new activities which match their tastes and are beneficial to their health, finances and interpersonal relationships. The end of 2019 will bring improvements for the sons and daughters of the bull, luck will smile on them with love, travel, good communication and intimacy. In addition, they will shine in their studies and in business they will be able to expand their market share. Peace and a reduction of tension will be fundamental for finishing the year on a high note. This year Leo will do a lot of reflection and will start analyzing several aspects of their life. They will feel that their path is gradually being illuminated allowing them to be at peace with themselves and with those around them. They will be attentive to changes, and the influence of Mars, the ruling planet of 2019, will give them determination, a good attitude and the adaptability necessary to face changes, mainly related to work. If one door closes, another will open, but the most important thing is that the attitude of the followers of the lion will be optimistic and positive, which is already halfway along the path towards success and good fortune. Halfway through the year, some problems and doubts that could have been affecting Leo in the first few months of the year will be left behind and the sons and daughters of the lion will begin to grow in magnetism and attractiveness and they will end up as the conquering beings that they are. Friendships, aid and the same planetary alignment are going to induce them to be calmer with economic issues and experience a financial boon. The total solar eclipse on July 2nd will positively influence those born under the influence of the Leo as they will receive a financial boost that will remain on the rise until the end of 2019. Also, love relationships will have more clarity, tranquility and passion for both members if they are already together, as well as for those who do not have serious commitments. Health will also remain stable and there will be no major problems with the body. The luck of Leo will depend in part, on the attitude they have when confronting events, in a positive and optimistic way. The facts related to this will help them have an enthusiasm for what they do and it will expand into their workplace where they will be able to align new projects that have to do with their career. 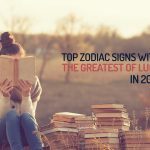 The natives of the sign will end the year with an excellent state of health thanks to the solar eclipse in Capricorn on December 26th which will provide energy towards adopting new habits to improve their lifestyle. Among all the signs, Aquarius stands out for its attractiveness, creativity and humanism, characteristics that will be exalted in 2019. On the one hand, there are timid, mystical, but enigmatic Aquarians and on the other there are the more exuberant, extravagant and artistic Aquarians. All of these natives will be more motivated with personal fulfillment and with the fulfillment of those close to them. The gregarious spirit will give them a lot of energy and they will establish new relationships throughout the year and strengthen bonds with relevant people. The opportunities that present themselves financially or in the workplace will be essential for keeping the followers of the sign at their maximum potential throughout the year. At the beginning they will have plenty of clarity with respect to their emotions and have a desire to enjoy relationships with their partner and friends. Sensuality will be an important factor for Aquarius all year, but mainly throughout the first few months. New business opportunities, studies, trips, investments or partners will present themselves and the member of Aquarius will know how to take advantage of them, both with respect to their career advancement and financially. Both Jupiter and Eros will provide these natives with charm, sympathy and good communication with others. Several planets, asteroids and the Sun will influence them so that their luck and good working relationships flourish. They will establish contacts and have the possibility for trips and new profitable projects. Their health will be very good in the middle of the year and they may vanquish some past demons which will open the way for reconciliation and grant leftover energy for adopting healthy physical habits. The charm of the sign will shine during the last stage of the year, where they will have romantic opportunities and very good relationships with friends. New investments in the financial sector and professional outlooks will improve thanks to the lunar influence in December. Also, the influence of the stars will favor good physical and emotional health at the end of 2019.